Even though I know diddly about architecture, I don't let it stop me from enjoying what I see. Be it Baroque, modern, Tudor, Roman, or cave dwellings, I don't care. I enjoy buildings. Period. They could be New York or Chicago skyscrapers or modern little townhouse complexes, or old-fashioned stately homes in New Orleans, I like what I like. Frank Lloyd Wright is synonymous with style and is appreciated by so many and this is a collection of his work in and around the Chicago area. Whether it was a Prairie or Usonian style piece of work, his work was always a cut above the rest. Having lived in two centuries (1867-1959) he was the forerunner and led with his designs - from homes to churches to warehouses, his style and imaginativeness lives on. Today his homes are lived in and cared for by modern-day families. Not only is this book full of illustrations of Frank Lloyd Wright's work, there is a comprehensive and interesting history about the man, his life, and his vision. The book breaks down his work into the various years and gives the addressess, if you're ever in the area... I loved the houses on the following pages, and would love to see them in person: 39, 87, 270/271, and the windows on page 389. Frank Lloyd Wright is most identified with having designed the Guggenheim Museum in New York City. Undoubtedly the greatest American architect, Wright molded the way we build today but unfortunately, not nearly enough of his designs are emulated and non-descript suburbs mushroom up around the country. His work is a joy to see and experience for yourself. 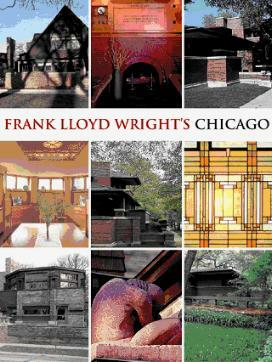 Frank Lloyd Wright's Chicago may be purchased and/or ordered through your local bookstore. Conclusion - A definite must for any lover of buildings and especially for Wright fans.